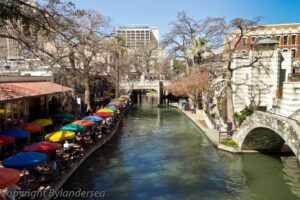 San Antonio‘s most sacred and historic site will always remain the Alamo, but the popular River Walk flows an economic lifeline through the heart of the city. Restaurants, cantinas, shops, business and museums thrive from tourist and residential traffic rolling along the five-mile Paseo del Rio. A little known and surprising story that saved the Texas waterway goes to none other than a few simple puppets. When a devastating flood hit the city in 1921, a disaster control plan was devised to prevent future damage and loss to the business district. . The goal was to drain the river and divert it through a storm sewer — then pave over paradise. Thank heavens the clever minded Conservation Society came up with a brilliant idea. The organization performed a captivating puppet show which pulled the heartstrings of city hall commissioners and focused attention on San Antonio’s natural wonder. Afterward, Society members took the civic leaders on canoe rides designed to convince them to rescue the river. It worked. The massive construction project commenced in 1939 and was completed by the WPA in 1941. The meandering oasis provided San Antonio with green parks and two parallel sidewalks. The water depth of the Venice-like canal ranges from just two to four feet, so there isn’t much danger if anyone falls in. However, about 2,000 partying patrons or klutzes per year take a plunge, likely begging mercy to avoid the $200 fine. 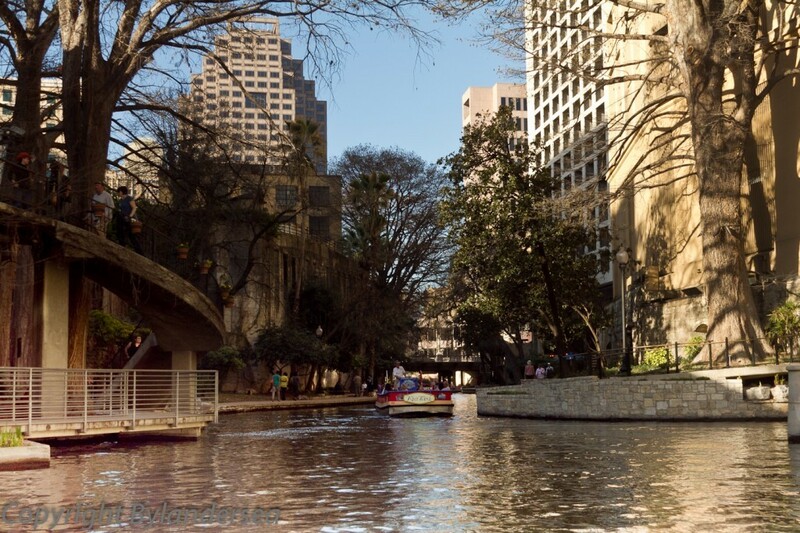 A 35-40 minute cruise on the River Walk remains a must for any tourist. Riders board either an open air water taxi or sightseeing barge while tour guides retell history and interesting trivia along the two and a half mile course. A recent $74 million Museum Reach extension was completed in May, 2009, including a new lock and dam. The additional mile and a half from Lexington to Grayson Street included $11 million dedicated to privately funded art-projects. 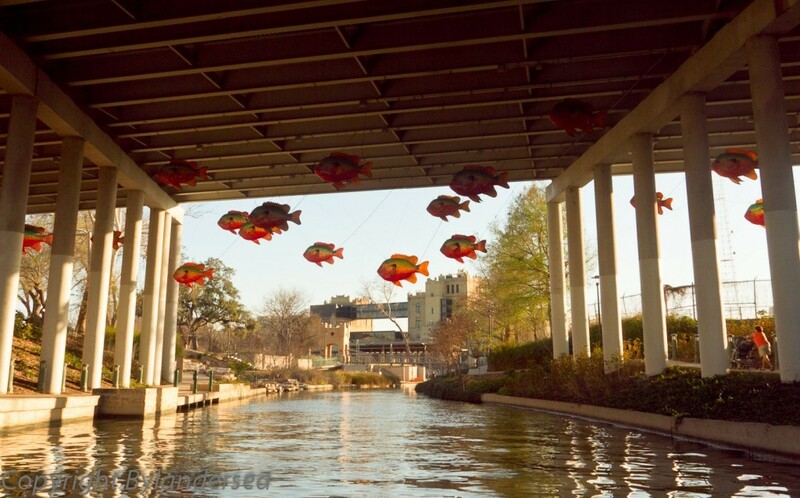 The San Antonio River Foundation commissioned eight artists to create site-specific art installations spaced around eight bridges. 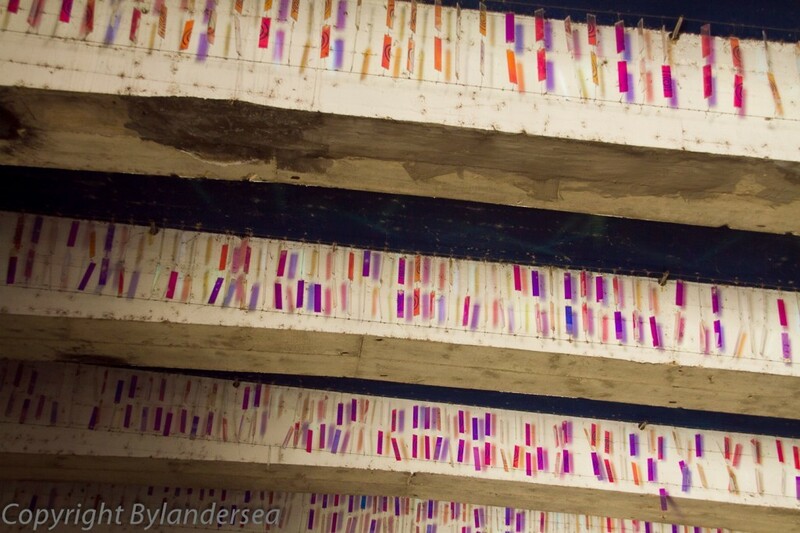 At the Lexington Street Bridge, British artist Martin Richman installed reflective, suspended elements that dance in the breeze, scattering flashes of color like glittering prisms. I’ve seen similar dangles made into earrings, but must admit, the reflections were pleasing. 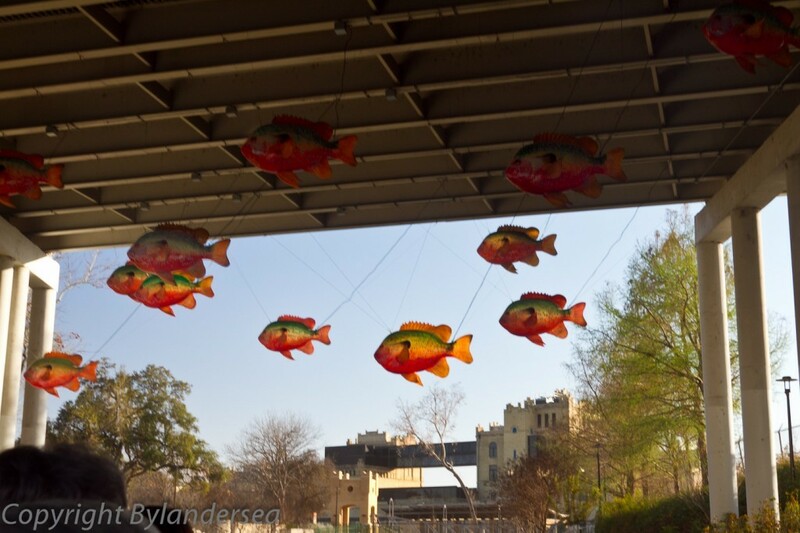 Dangling artwork reflects the light along the River Walk. 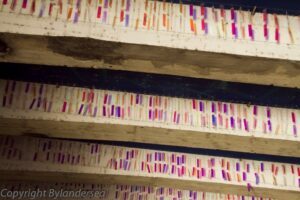 As visitors pass beneath two bridges at McCullough and Brooklyn, groups of shimmering steel-mesh panels on either side come to life and change colors. Our tour guide claimed that nearby pedestrian traffic creates even more stimulating effects. Sequenced speakers under the Jones Avenue Bridge pitch “sound sculptures” from artist Bill Fontana’s blend of recorded and live broadcasts. I heard what sounded like nothing more than typical morning birdsong. Perhaps I don’t have an artist’s ear. 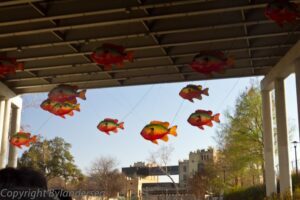 My favorite section of river art was the school of larger-than-life fiberglass fish suspended above the water and below the Interstate 35 overpass. Philadelphia artist Donald Lipski was the brainchild behind these whimsical creatures which reflect onto the river below. Very cool! The tour guide also said that a sunset water taxi provides a memorable way to see the new River Walk art installations. The magic hour of twilight — a photographer’s preference — brings out the artworks’ full charisma and beauty. And then after darkness falls, indulge in libations and dinner from the varied culinary establishments along the banks as the art installations glow luminously in the background. My hometown, Jacksonville, Florida is divided by a river, but the immense width of the St. Johns River dwarfs the petite San Antonio. 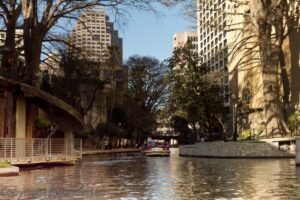 In this case, however, the compact is superior because much of San Antonio’s charm and tourist traffic are indebted to the secluded ambiance of River Walk–and the legendary puppet show.